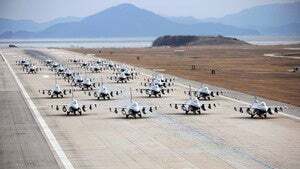 Unless you're part of the United States Air Force, you have never seen something like this: Twenty-seven F-16 Fighting Falcons taxying down the runway, fully armed and ready for immediate take off and battle. No, the aliens are not arriving and China hasn't launched any missiles (yet). The photo, taken by Staff Sgt. Rasheen Douglas, shows an "elephant walk" formation of Falcons from the 8th and 419th Fighter Wings. It's the final part of an exercise designed to demonstrate the capability of the airmen at Kunsan Air Base, South Korea, "to quickly and safely prepare aircraft for a wartime mission."